Missing football already? Get your footie fix here with Super Shot Stopper 2015. 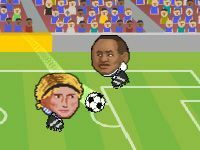 The next game in our Summer of Football - Super Shot Stopper World Cup version. Relive your student days with this Table footy competition! Use the power bar to crack in goals! NO SPINNING ALLOWED! Can you shoot your team all the way to the FA Cup Final? Your team has been picked for the Super League - can you bend in your balls and take your club to the title in this Free Kick game? Pass the ball around and boot it against the ref to make him show red. Can you pass all 36 levels of ref-baiting action?